Heat treatments the one of the most effective and eco-friendly ways to get rid of bed bugs. Bed bug heat treatments have become one of the most popular methods of bed bug control in New England as well as throughout the entire country. As bed bugs continue to infest homes and businesses everywhere, there is no room for treatments that are not effective in getting rid of bed bugs. 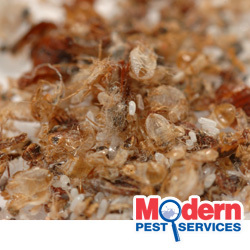 At Modern Pest Services, we offer our Maine, New Hampshire and Massachusetts residential and business clients the eco-friendly, non-chemical and safe approach to killing bed bugs: bed bug heat treatments. You may have heard about heat treatments, also called thermal remediation and we want to help you understand why this is such a great technology to not just get rid of the live bed bugs that are present but their eggs as well. Heat treatments go beyond what chemicals can do to control and stop the spread of bed bugs and now Modern offers both electric and propane heat treatments. Heat – Portable heaters pump hot air into the infested areas. Temperatures are slowly raised to 120 to 140 degrees and then held for many hours to kills bed bugs and their eggs. Airflow – Portable fans are placed strategically around the infested areas to allow heat to flow evenly through the space. The fans help heat permeate the cracks and crevices where bed bugs often hide. Monitoring – Sensors are used to monitor the heat levels and ensure that the infested areas are receiving enough heat to effectively kill all bed bugs, including their eggs. The heat is non-toxic and environmentally friendly. Treatment times are shorter and in most cases, one heat treatment will be all that it takes to eradicate the bed bug infestation. Treatments can be done in zones (only the infested areas) so other areas can remain in operation. Though heat treatment is highly effective on its own, additional targeted chemical treatments can be helpful in some cases. Depending on the severity of the infestation, your Pest Management Professional (PMP) may chose a combination of heat treatments and conventional chemical treatments. With each case, our PMP’s will provide a thorough inspection to determine the best course of action for eradicating bed bugs. So if you are living or working in Maine, Massachusetts, or New Hampshire and you are worried that bed bugs have infested your home or business, simply contact Modern Pest Services. Ask about our electric and propane heat treatments and ways to prevent future bed bug infestations through Integrated Pest Management (IPM) techniques.